Christmas Box Surprises Promo! ~ Philippine Freebies, Promos, Contests and MORE! 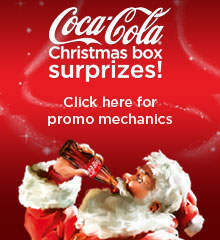 Christmas is nearly approaching and with that comes Coca-Cola's Christmas Box Surprises promo. Collect two (2) caps or five (5) crowns of any Coca-Cola variants such as Coke (regular, light, zero), Sprite and Royal Tru-Orange. Exchange this for specially-marked Coke Cards at qualified redemption centers nationwide. Find the promo code and text in your entries in this format: COKE [CODE] to 2653 (P1 standard charge fee per text). You will receive a one-time registration message, COKE REG [FULL NAME]/[AGE]/[COMPLETE ADDRESS], which you will send to 2653 FREE of charge. Be one of the six (6) raffle winners of P1M cash or take home surprize boxes containing digital gadgets, home entertainment system, music gadgets, gift certificates, and noche buena package. Text in as many valid entries as you can for greater chances of winning!